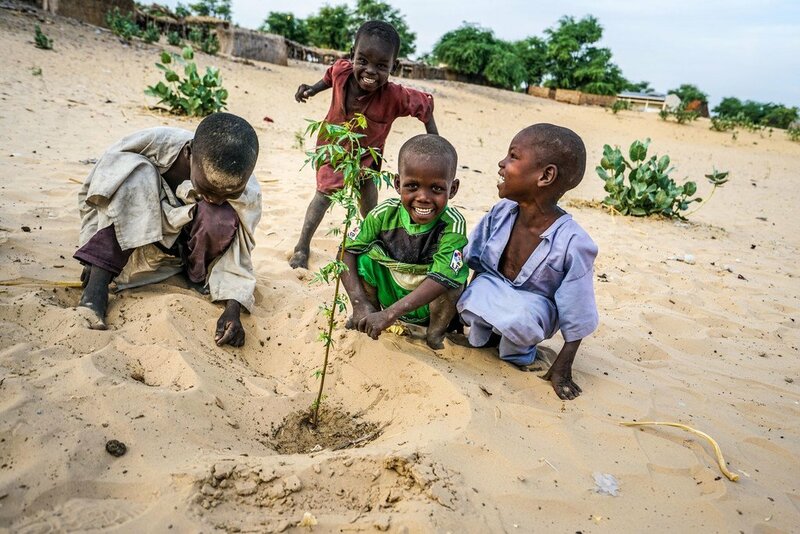 UNDP Chad/Jean Damascene Hakuzim In the reforestation site of Merea, Chad, children are planting acacia seedlings for the future In the past 50 years, Lake Chad basin shrank from 25,000 square kilometers to 2,000square kilometers. For two weeks, the conference has brought together thousands of climate action decision-makers, advocates and activists, with one key objective: adopting global guidelines for the 197 parties of the 2015 Paris Agreement, when countries committed to limiting global warming to less than 2°C – and as close as possible to 1.5° – above pre-industrial levels. The UNDP study shows that, should the world fail to limit global warming to less than 2°C, families will find it harder and harder to feed themselves, and the risk of famine and increased poverty will rise along with temperatures. Higher levels of poverty would further limit the capacity of communities to manage climate-related risks, according to the report, placing further stress on already overstretched coping mechanisms, and could translate into more risky migration patterns, serious epidemics such as the 2014 Ebola outbreak across West Africa, and greater political instability. “They are among the most vulnerable to climate change, yet the least able to adapt. In many cases, they lack the technical, financial and institutional capacity to identify the best ways to build resilience,” said Gustavo Fonseca, from Global Environment Facility, an institution that has been funding many climate adaptation projects in Africa. According to recent estimates from the Food and Agriculture Organization of the United Nations (FAO), for the first time in over a decade, world hunger is on the rise, affecting 11 per cent of the global population. This is in part due to extreme droughts induced by an abnormally strong El Niño cycle, which led close to 40 million people in Africa to be in need of humanitarian assistance. “For me the critical component is knowledge and capacity-building,” said Rohini Kohli, who leads Adaptation Planning at UNDP. However, measures to enable communities to adapt to the changing climate is a costly matter that will require creative financial mechanisms and substantial engagement with the private sector to meet. It will require developed nations to make good on their 2015 Paris Agreement commitments to dedicate $100 billion annually to supporting climate action in developing nations. The report analyses a number of noteworthy successes in climate change adaptation in Africa over the past decade, including projects aimed at improving food security in Benin, Mali, Niger and Sudan; supporting governments in having improved climate information and early warning systems to save lives from fast-acting storms; and empowering women to be effective climate action champions.